Ah yes ... the horse racing subsidy. The 2000-2001 report shows a stunning surge of more than half a billion dollars in profits from some 5,000 slot machines at 12 racetracks. One-armed bandit lounges were expanded with some controversy the year before to bolster the flagging racing sector. I added the emphasis to be clear that things started off pretty good. 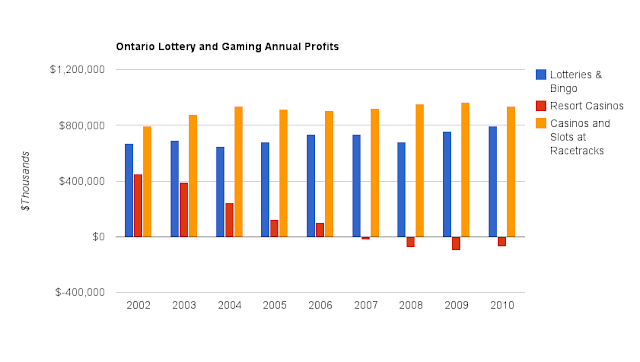 In 2002-2003 annual's report we see racetrack accounting shown separately from charity casinos (racetrack's providing 77% of the total of the two with revenues of $1,262,523 and direct operating expenses of $614,262), but after that they are shown together. That's a lot more than $334 million a year. That's not Donald Drummond's point though - he points out slot machines put at sites geared to that, instead of tagged onto horse tracks to prop up a dead model, would be far more profitable. Fortunately, we have a group of sites developed just for slots. The are called resort casinos. Now if Drummond, Duncan, Radwanki, Regg Cohn, etc., had any horse sense we'd see the decline of money from one business (revenues less net expense), while the other escalated. Reality stupidly refuses to submit to the definition of reality dictated by Drummond's commission, and it's mainstream media cheerleaders. How many needles can you buy by dumping $650 million a year in revenue to save $334 million in expenses? Those $4 billion in subsidies seem to have $6-7 billion of revenues offsetting them (some of the $9 billion of revenue being from charity casinos). This isn't proof the Premier hates rural Ontario. It is a good indication in dealing with OLG, a serious person would start with the resort casinos. Maybe horse shows would help. I tend not to leave a response, but after reading through some of the comments here "The Myth of the horse racing subsidy". you. Could you post a list of all of your social networking sites like your twitter feed, Facebook page or linkedin profile? or figuring out more. Thank you for wonderful information I used to be searching for this information for my mission. I'll right away take hold of your rss as I can not to find your e-mail subscription hyperlink or e-newsletter service. Do you have any? Kindly let me realize in order that I may subscribe. Thanks. It's genuinely very complex in this active life to listen news on Television, thus I only use internet for that reason, and take the newest information. It's going to be finish of mine day, except before finish I am reading this great paragraph to increase my experience.